Last week we began a story about Casey wanting a cookie really, really badly. She made a plan to take it without her parents noticing, and she was about to grab it when she saw a note. Keep reading to see what the note says, if Casey gets the cookie, and what happens next! You can read the first-half of the story here. When Casey got to the kitchen she jumped to her feet, as quiet as could be. She carried a chair and placed it down, climbing onto it without making a sound. When she looked at the counter she saw the cookie -- but next to it was a note! Casey stared at the note, squinting her eyes in the dark, and bringing it close. She gasped as she saw one of the words. The note said three words, and even though Casey couldn’t read, she recognized her mom's writing and saw that one of the words was her name. When Casey saw her name she felt really bad. She was sure the note was telling her not to eat the cookie! Casey was disappointed in herself for not listening. How did her family know she would try to steal the cookie after they fell asleep!? Sadly, Casey climbed down from her chair, and walked back to bed. She took off her hat and her socks and tried to fall asleep. When Casey woke up she walked to the kitchen, and saw everyone there, staring at her. She thought they were all mad at her for trying to steal the cookie. Casey started to cry because she felt so bad, but her Mommy and Daddy hugged her, asking why she was so sad. When Casey told them she almost ate the cookie, her Daddy smiled and said "It’s a good thing you didn’t, and you should have listened better, but the cookie's been for you all along". And her sister brought her the cookie, singing a song. "Happy Birthday!" her family shouted as they hugged her. Casey was so happy she couldn’t stop smiling! She cried with joy that she had listened after all. Casey decided that from now on, she would always try her very best, and nothing less, to listen to her parents. Her mom was right, good things come to those who wait. Casey learned that she should listen to her parents. As one of the Ten Commandments says, “Honor thy father and mother.” When have you listened to your parents? 10 years ago, some of the kids from the Food Pantry started asking for notebooks, pens, etc as the school season approached. Advent got together and collected tons of supplies to hand out to kids in need! 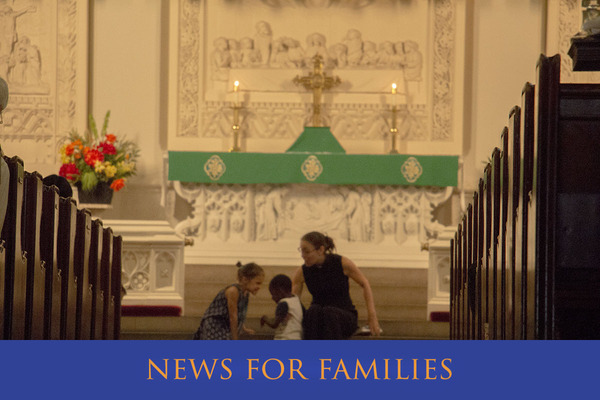 This great tradition will continue until Sunday, August 6, and your donations can be left in the back of the sanctuary. On Monday, August 7 supplies will be handed out to the children. Every child wonders where God lives or what God is like. 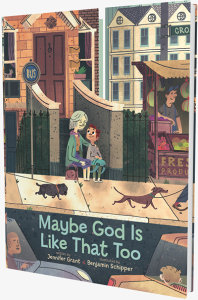 In Maybe God Is Like That Too, a young boy asks his grandma where God is in their city. She invites him to pay attention to where he sees the fruit of the Spirit. Where love, joy, peace, patience, kindness, goodness, faithfulness, gentleness, and self-control are, there too is God. The boy sees God in the kindness of a doorman holding the door for a man using a wheelchair, in the patience of his teacher helping him tie his shoes, and in the love, faithfulness, and gentleness of his grandma. An ordinary day in his city opens this young boy’s eyes to God’s Spirit at work all around him. Water Come Down: The Day You Were Baptized, Written by Walter Wangerin Jr. 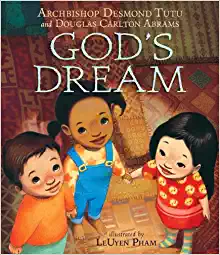 Beautifully written by award-winning author Walter Wangerin Jr., this lyrical story introduces kids to the beauty, joy, and meaning of baptism. The perfect gift to make a child feel special – like part of the most wonderful family in the world. 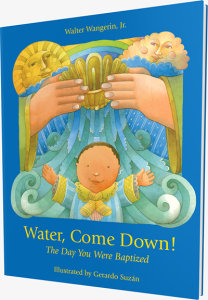 With a dedication page to commemorate a special occasion and a parent section to help impart their families’ unique perspective on the meaning of joining God’s family, Water Come Down is a wonderful introduction to the significance of baptism, its roots in the biblical story and its meaning for life today. de of their skin. Aided by vibrant artwork, Tutu conveys the essence of his ubuntu philosophy, a wisdom so clear and crystalline that even the smallest child can understand. From early on, children are looking to discover their place in the world and longing to understand how their personalities, traits, and talents fit in. The assurance that they are deeply loved and a unique creation in our big universe is certain to help them spread their wings and fly. 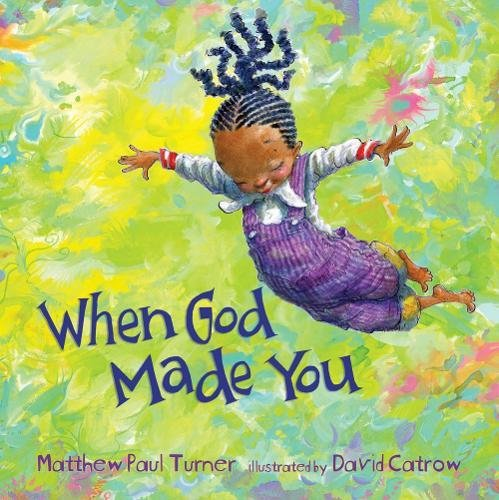 Through playful, charming rhyme and vivid, fantastical illustrations, When God Made You inspires young readers to learn about their own special gifts and how they fit into God’s divine plan as they grow, explore, and begin to create for themselves. 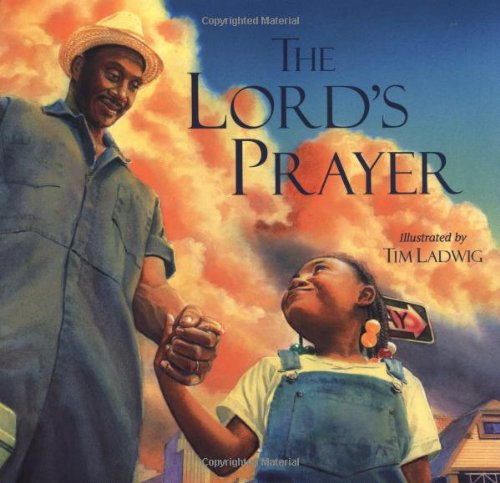 The beloved words of The Lord's Prayer serve as the text for a picture book that shows a young girl and her father spending a day together and helping an elderly neighbor. 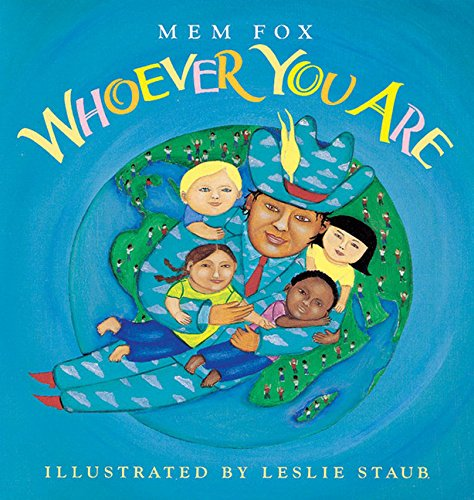 “Little one, / whoever you are, / wherever you are, / there are little ones / just like you / all over the world.” So begins the Australian author Mem Fox’s joyful picture book Whoever You Are, a celebration of the world’s diverse cultures, both our similarities and differences. Leslie Straub’s innovative, colorful, folk art–style oil paintings of children from all corners of the globe are bordered with photographs of hand-carved, bejeweled frames—and they all reflect Fox’s message that no matter where we come from, within our hearts “Joys are the same, / and love is the same. / Pain is the same, / and blood is the same.” A gem! 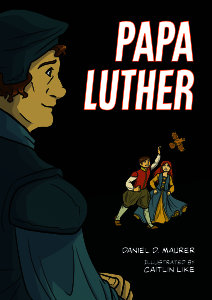 The exciting story of Martin Luther, told through the eyes of his children Hans and Magda. This colorful, 88-page “comic book” is geared especially toward children ages 8 to 13, but will intrigue all ages. *We have a copy of this book we'd love to lend out. Speak to Kevin if you would like to borrow it. With Summer Suppers in full swing, we want to make sure everyone is signed up. Summer Suppers is a celebration of community and all are welcome, the old and the young, Spanish speakers and English speakers, the seeker and the faith-filled. Whatever your level of comfort or experience with another language, it is a place to learn and understand God safely in your community. Come as you are to Summer Suppers and experience a meal and laid back service that will fill you up (literally and figuratively). At Summer Suppers you don't need to bring forth your faith, it comes and sweeps you away. At Summer Suppers the whole Advent community is united. Summer Suppers will run Wednesdays from July 12 to August 16. Be sure to stop by one night, 4:30pm for Toddler Time, and 5:30 pm for the meal. 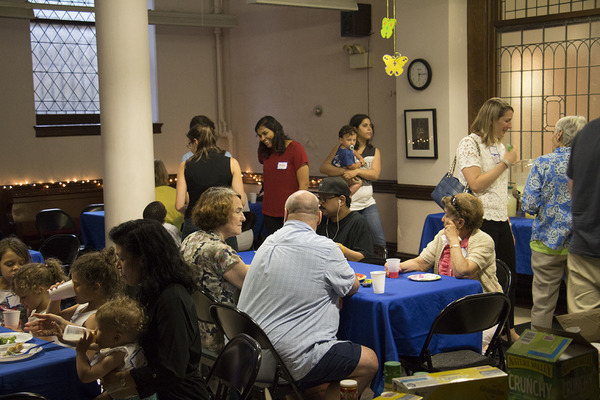 Check out the photos from our Summer Suppers pre-event here. You can view the full schedule and register online on our website, or pick up a registration form on the back table in the sanctuary.